Winger available as contract talks stall. 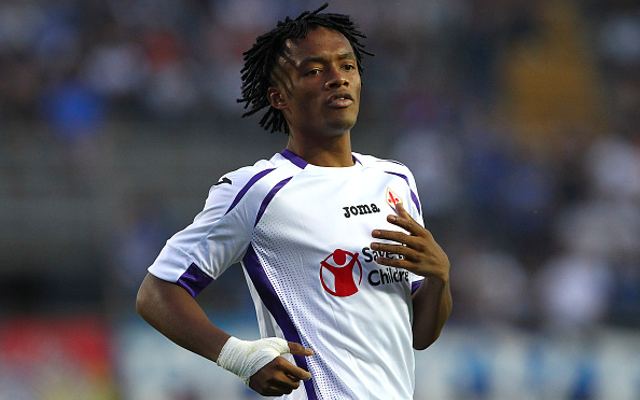 Manchester United and Chelsea are said to be on alert as Fiorentina winger Juan Cuadrado stalls on signing a new contract with the Serie A club, according to the Daily Star. The Colombian international, who was reportedly the subject of a £32m bid from United in the summer, is one of the most sought-after wide-players in Europe at the moment, having also attracted strong interest from the likes of Barcelona and Bayern Munich. United may no longer have a place in the team for Cuadrado due to a formation change by Louis van Gaal, who initially eyed him as an ideal addition at right wing-back, though he seems to have moved away from this system for the time being. Chelsea, however, may still be on alert for his signature in the next transfer window, with Blues boss Jose Mourinho always on the lookout for top talent in the transfer market, with Cuadrado able to fill a number of midfield roles. The 26-year-old is currently making just £1m a year, and is understandably keen to earn a pay rise, though he may also look to use that as a route to a bigger club.